Machine to open, fill and seal pre-made bags, such as Doypacks, Flatbottom, Sidegusset, 3 side sealed bags, piping bags and many others. Max.speed: 10 bags / minute (depending on filling time). A pneumatic arm with suckers catches one of the bags from the charger, by means of venturi effect (1). Then, it places it in the filling position (2). The bag is opened (3) and filling can start, as a signal is sent to filling machine (4). When filling is done, the sealbars close (5) and once the bag is sealed, they open and the bag falls onto an exit conveyor (6). Machine comes standard with one funnel which is related to given bagsize. If more bagsizes are used which are much smaller or bigger you might need an extra funnel to keep up speed in filling process. Additional jaws who clamps the bag around the funnel when filling process starts in order to achieve as less product in the air. Often used for light powdery products. Special device which opens the zipper before funnel enters the bag. Used for filling above 1KG and used for tapping under the bag to lower the product level while filling. Vibrating motor connected on funnel for better product flow on sticky products. 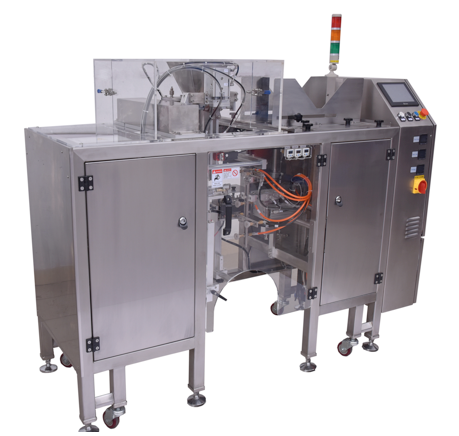 Separate weighing machine which doses the product before dropping into the funnel of the bagger. This machine communicates with the Buffalo so it drops and doses automatically. Filled bag drops onto this conveyor which will transport it away to for instance rotating packaging table. For more information please call direct our machine department number; +31 (0)85 486 5244 or send us an email.